'Laser eye surgery' is an umbrella term for the various medical procedures used to correct common vision problems such as myopia, hyperopia and astigmatism. The operation uses a cool beam of light emitted from an excimer laser to reshape the transparent layer at the front of the eye (also known as the cornea). It is now the most frequently performed elective procedure in the world, and has a very high success rate. The possibility of complications arising from the surgery are very low, with many patients only reporting minor side effects such as blurred vision. 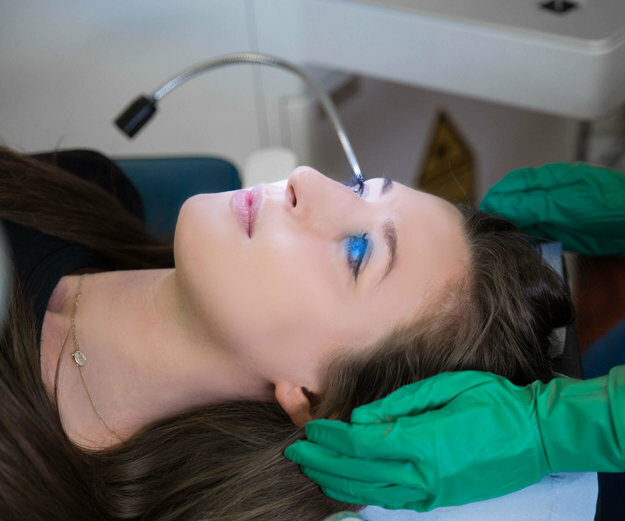 Laser eye surgery is the most commonly used elective procedure performed in the world today; there are thousands of people benefiting from this procedure in the UK every year. Laser eye surgery is a corrective procedure which uses an excimer laser to carefully alter the shape of the front surface of the eye, otherwise known as the cornea. The treatment is safe, comfortable and effective, and typically laser eye procedures last less than one hour. In the majority of cases people experience a noticeable improvement in their eyesight within 24 hours and in many cases patients can return to work within a couple of days. How Much is Laser Eye Surgery? The cost of laser eye surgery will vary depending on a number of different factors, including your prescription and the type of procedure you undergo. In the UK the average price for laser eye surgery starts at just under £1000 per eye. Many clinics also provide finance options to help spread the cost of surgery over a number of months, allowing patients to pay for their treatments in monthly installments. Imagine not having to rely on glasses and contact lenses and the freedom that 20/20 vision could bring you. Play sports freely, work, and enjoy life without having to rely on glasses or contact lenses. Clear vision from the very moment you wake up, it’s never been safer or more affordable to achieve 20/20 vision. Why not find out if you’re suitable for laser eye treatment by getting in touch? LASIK: Laser In Situ Keratomileusis (LASIK) is the most commonly performed type of laser treatment in the UK, accounting for approximately 70% of the market. It is used to treat myopia (nearsightedness), hyperopia (farsightedness) and Astigmatism (defect to the shape of the eye). In LASIK surgery, the surgeon uses a microscopic blade to create a tiny opening to access the corneal tissue and then uses a laser to reshape it for more accurate vision. The opening is then re-closed and as the incision is so small, no stitching is required. Intralase Wavefront LASIK: Intralase Wavefront LASIK is a more advanced version of the LASIK procedure, where a laser is used to create an opening in the cornea instead of a blade. This means the incision is more precise, cleaner and altogether thinner than standard LASIK giving you a greater chance of attaining 20:20 vision. LASEK: Laser Epithelial Ketatomilieusis (LASEK) is an alternative to LASIK surgery and uses a finer laser to reshaping the surface layers of the cornea under the epithelium. This treatment is used to correct correct myopia (nearsightedness), hyperopia (farsightedness) and/or astigmatism. Wavefront LASEK: Wavefront LASEK is a state of the art version of LASEK that is specific to your individual eye shape on a very fine scale and has more precise results. Wavefront is a computer program used in conjunction with both LASIK and LASEK procedures. It is used for patients suffering from myopia, hyperopia and/or astigmatism. Photorefractive Keratectomy: Photorefractive Keratectomy (PRK) is the original type of laser surgery performed in the UK. It is quite similar to LASEK, and is also used to correct myopia (nearsightedness), hyperopia (farsightedness) and astigmatism, however it involves the removal of the outer layer of the cornea (called the ‘epithelium’), a cool ultraviolet light is then beamed onto the eye to precisely remove tiny bits of tissue from the surface of the cornea in order to reshape it. The process is seen as more invasive than LASIK and also less precise and more painful. However, it is still an option for those who cannot have other types of surgery. EpiLASIK: EpiLASIK is a procedure very similar to standard LASIK, preferred for patients with flatter corneas or milder forms of myopia, as it is more difficult to perform on patients with steeper corneas. It is suitable for people who cannot undergo regular LASIK surgery as it is the least invasive procedure. Your optometrist should be able to explain the different procedures available to treat your particular eye condition. The conditions most commonly treated by laser eye surgery are myopia (short-sightedness), hyperopia (long-sightedness), glaucoma and astigmatism. The most important step in choosing your surgery procedure is doing your own research, not only into the type of procedure but also into the clinic and even your surgeon. Once you have found a reputable eye surgery clinic you should then arrange a consultation to discuss the procedure itself, the risks and recovery period and also the financial implications and payment options available. Privately, the cost of laser eye surgery in the UK can range from just £595 per eye up to £2,175 per eye. The table below shows you how much you can expect to pay for the different types of laser eye surgery. These prices are based on those advertised by the UK's leading eye surgery clinics. There are a range of factors that can affect the cost of surgery. These include your prescription (which depends on the type of eye condition you have), the type of surgery required, and the reputation of the clinic and operating surgeon. Therefore it is important to perform a laser eye surgery cost comparison against these factors. To help you spread the cost of surgery, many of the clinics we work with offer patients a range of financing options, including monthly payment plans with a small upfront deposit. The repayment conditions will vary from clinic to clinic and most will require patients to undergo credit checks before they are offered. To find out more about financing options for laser eye surgery, visit our price guide. Bank loans are also available for health operations and it is also a good idea for potential patients to check the details of their health insurance to check whether their policy includes cover for such surgery. Can I Get Laser Eye Surgery On The NHS? Laser eye surgery is usually only available on the NHS if the eye condition can lead to loss of vision without treatment. Conditions include diabetic retinopathy, wet macular Degeneration, severe cataracts and corneal diseases. However getting eye surgery to fix refractive errors, or for cosmetic reasons (such as not wanting to wear glasses), is not considered essential as there are non surgical options available. My name is Djalenga Scott, I’m 29 and I’m going to have LASEK eye surgery on Friday. What Is Your Eyesight Like At the Moment? I’ve got minus two in one eye and minus one point seven five in the other so I can see three meters probably, well I don’t even know if I can see three meters properly, maybe two and then anything further away from that is just a bit of a nightmare for me. How Does Your Poor Eyesight Affect Your Life? It’s very frustrating when you have to remember to take your glasses everywhere and I’m a very forgetful person, so I always forget. I’ll go see a show or something and I’ll get there, and I’m like “oh” don’t have my glasses. Watch the whole show, can’t see anyone’s face, it’s just a nightmare. I hate wearing contact lenses; they’re so uncomfortable so they’re just not an option for me. Did You Know About LASEK Laser Eye Surgery Before Your Consultation? I have talked to some friends who have sisters or friends of friends who have done it, and everyone says it’s quite a quick easy simple thing. I didn’t really think it would be something that would be possible for me or that I would even have the time to do it. I didn’t realize how quick the recovery time is, or I didn’t realize it was so easy. Everything, just being able to actually realize when I know someone on the street and not say hello to strangers, or ignore people that I do actually know, would be quite nice. Is There Anything You Are Worried About? I’m worried about how painful it will be, or like how long it will take to recover but I think it’s natural to be a little bit nervous. So the surgery, what’s today – Monday, so this Friday. I’d like to just go (snap) and make it be a month down the line and just see everything perfectly. I can’t believe it’s quite real. What Was The First Think You Noticed With your Improved Eyesight? When you arrive for your procedure, your ophthalmologist will likely take steps to help you feel comfortable, as it’s natural to experience some pre-surgery nerves. Once settled in, you’ll undergo a final examination to ensure all the measurements and settings are correct. If everything is confirmed and there are no alterations needed, you will be prepped and changed for surgery. Your surgeon will administer anaesthetic and ensure you are comfortable before performing the procedure itself, which takes just a few minutes. Your surgeon will walk you through each stage of the procedure to help you feel at ease, and once it is completed, you’ll be ready to begin the recovery process. For LASIK surgery, recovery time is usually 24-28 hours and most patients are able to return to work the next day. However recovery for other types of procedures may take up to 3 months. Its essential to discuss your recovery with your surgeon pre and post surgery. Laser eye surgery has a very high success rate. Risks and complications associated with the procedure are extremely rare, however it’s important that you speak to your consultant and ensure that they have outlined any potential risks. Redness or soreness, often described as ‘dry eyes’. This can be easily remedied using eye drops prescribed by your clinic. Problems with vision, such as blurred vision, halos around bright lights, double vision and light sensitivity. These problems typically resolve within three months of your surgery without the need for medical attention. As with any operation, there is a small chance of an infection developing. However this can be easily treated with antibiotics which your clinic should administer to you to prevent any further complications. All prospective patients will undergo an in-depth examination and consultation to ensure they are an eligible candidate for eye surgery. The question does laser eye surgery hurt? Is one of the most popular queries clinics receive. Patients generally report little to no pain during the operation itself, especially if they remain calm and do not resist the device. This is because the surgeon administers eye-numbing anaesthetic drops at the beginning of the surgery. Some patients however do report slight discomfort when their eyelids are kept open with an instrument that allows access to the cornea, and prevents any blinking that would disrupt the surgery. If this is something that makes you feel anxious, you can get a prescribed mild sedative to help relax you before the surgery. A slight pressure to the eye can be felt during the laser correction application itself, and is the most widely experienced sensation. During the recovery period is when patients will experience some discomfort. For those that have the more popular LASIK procedure, Ophthalmologists warn that patients should expect to experience dry eyes, mild itching and a stinging sensation that will steadily diminish within 24 to 48 hours, after which patients can return to normal activities. The more invasive LASEK operation can produce pain levels of moderate severity that may be lessened with the use of painkillers as prescribed by the surgeon. This pain can be expected to be over in 24 to 48 hours, although most patients will feel some discomfort for anything up to seven days following the procedure. The type of surgery you wish to have (such as LASIK, or LASEK). Your budget (if you are not having treatment on the NHS). Your location, and whether or not you are willing to travel for treatment. Some of the leading clinics are Optical Express, Optegra, Advanced Vision Care (AVC) and Moorfields Eye Hospital. In addition to finding the right clinic, you should inquire about the qualifications and experience of the surgeon who will be carrying out your treatment at the clinic. The Royal Society of Ophthalmologists awards Certificate of Competence in Laser Eye Surgery to members who have carried out a minimum of 300 procedures over a two-year period, so it’s important to ask if your surgeon has this accreditation among others.